Heat beans and roasted tomatoes in a small frying pan, just until warm. Spread onto serving tray(s). Mix sour cream and taco seasoning. Divide and spread on top of the bean mixture. Sprinkle the grated cheddar evenly over the previous layers. Place in refrigerator and prepare the guacamole - just mash the avocados and season. Remove the tray from the refrigerator and spread with the guacamole. Sprinkle on the Monterey Jack cheese, followed by the pico de gallo, olives, and green onions. I am mad for a Layered Taco Dip. Always have been. Always will be. Everyone is, in one iteration or another. The dip’s versatility is the reason that I didn’t preface it with “7 layer” or “5 layer”. At my house, taco dip components vary wildly based on what’s in the cupboard, and what people like (or can’t eat). Aunt Betty allergic to avocados? No problem, leave off the guacamole. Out of salsa? Chopped tomatoes it is. Start to finish, there aren’t many recipes that are as speedy, or easy, to prepare. I do like to add an extra step of quickly warming and seasoning the Old El Paso refried beans. I will often add a small can of chopped green chilis. This time, I tried Muir Glen Fire Roasted Tomatoes with Chipotle, which adds the perfect touch of smoky pepper flavor to the base of the dip. 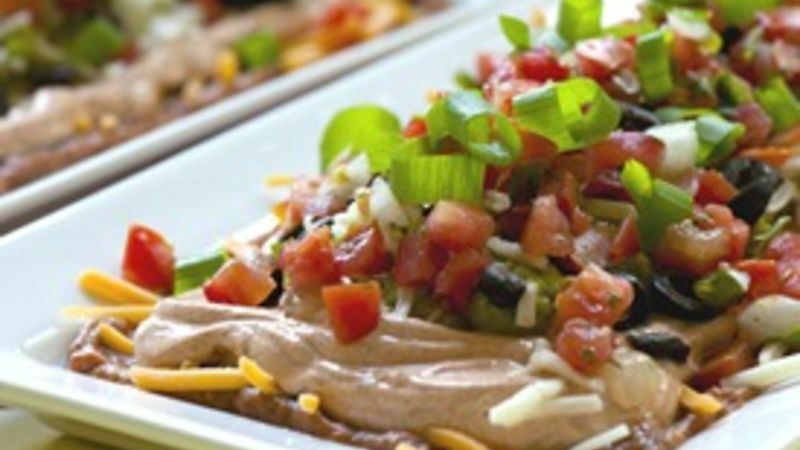 Other than the dressed-up beans, the recipe below is the classic, with the works: beans, taco-seasoned sour cream, cheese, guac, more cheese, olives, pico de gallo (or chopped fresh tomatoes), and green onions. The green onions are a key component for me. I like a little fresh “crunch”, which is usually provided by using shredded lettuce in other versions of this dip. However, I don’t like how the lettuce gets wilt-y. Green onions on the other hand are much hardier, and retain their crunchiness, even after a long while on the buffet table. Oh, and about the buffet table . . . this recipe makes a lot of dip, enough to fill a large plate or serving platter. My preference, however, is to make two or three smaller trays. With a large tray, the layers can begin to blend together and begin to look a bit highly trafficked. Completely avoidable with small trays!